Right after the Get Hooked on DIY event at Megamall, my fellow bloggy mommies and I went straight to SM Supercenter Pasig for Chai C. Galapon's book launch and signing. The program was already starting when we arrived and was glad to see Chai acknowledged it by smiling at us. I don't know her personally (hi, Chai if you're reading this) but I felt so excited and happy for her. I'm one with her dream to have a book published. I, too, have dreamed and still dream about it. One day, someday! Anyway, let's talk about the book launch. There were games, raffles and lots of food from sponsors! Unfortunately, I didn't win in any game or raffle. 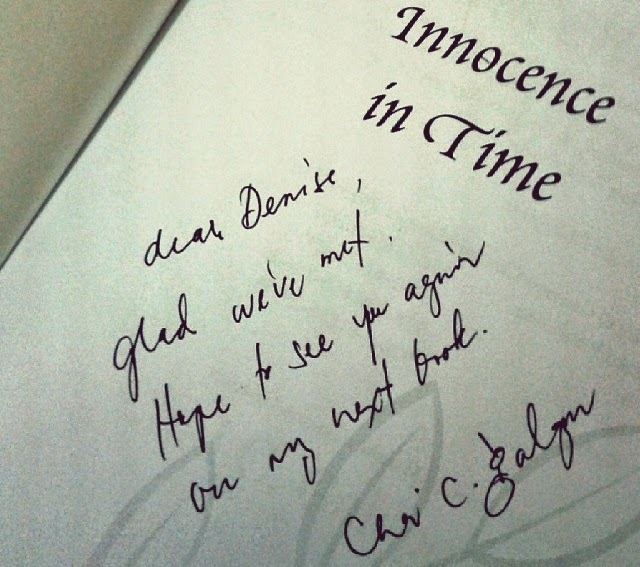 But I took home the yummy pasta with gourmet tuyo from Sweet Life Coffee, graham balls from Candeee, a loaf of wheat bread from Walter Bread and my own copy of Innocence in Time! Yay! I have yet to find time to read it but my friends said I can finish it in one sitting so I might do it tonight. Copies can be bought here if you are from US, Canada or UK and here if you are from the Philippines. The book costs Php190 only (plus shipping fee). For every book purchased, Php20 will be donated for the medication of Heart Calimlim's son, Yvan, who is a Pulmonary Dysplasia patient. The bloggy mommies I was with at the book launch: Pehpot, Kim, Krisna and Serene. Mommy Bloggers Love Johnny Rockets!